It might be hard to imagine a time when a 512 kilobyte computer cost more than $28,000. That was in 1984. Today, you can buy a much more powerful computer for under $300. 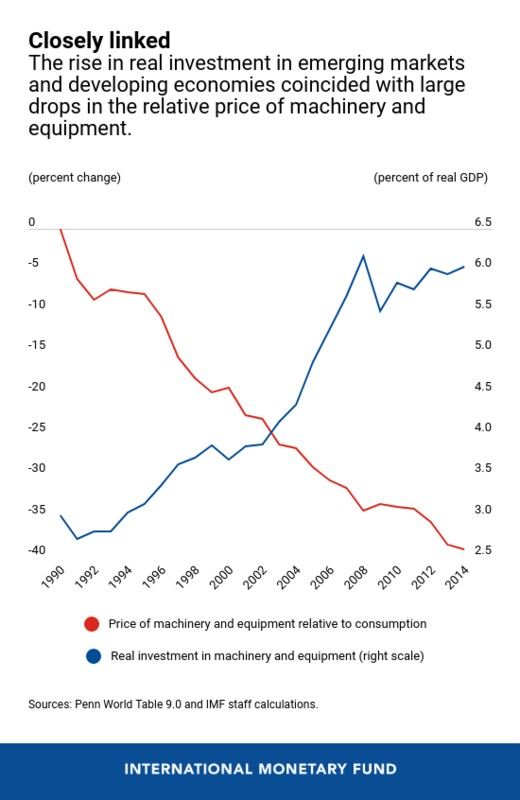 Prices of machinery and equipment have been falling relative to overall prices for decades, thanks to rising trade and sweeping technological improvements that led to more efficient production of capital goods. This has helped countries around the world raise real investment and improve living standards. But as our research in Chapter 3 of the April 2019 World Economic Outlook shows, this important driver of investment may be under threat. Trade tensions and sluggish productivity growth could slow the decline in the relative price of machinery and equipment, which would hold back investment growth worldwide. These findings provide an additional argument to lower trade barriers and reinvigorate trade. Trade tensions and sluggish productivity growth could slow the decline in the relative price of machinery and equipment, which would hold back investment growth worldwide. Since 1990, the price of machinery and equipment relative to the price of consumption fell about 60 percent in advanced economies and about 40 percent in emerging market and developing economies. The most striking was the fall in the relative price of computing equipment, which declined about 90 percent since 1990. These were dramatic declines when compared with the relative prices of other types of capital assets, such as housing and commercial structures, which more closely tracked the price level of consumption. Trade integration has been the biggest factor behind falling prices of machinery and equipment relative to the price of consumption, based on our analysis using detailed price data across more than 30 sectors in 40 economies. Greater competition from abroad led domestic capital goods producers to lower prices. It also pushed them to raise their productivity. Through these two channels, trade contributed up to 60 percent of the observed fall in the relative price of machinery and equipment between 2000 and 2011. Faster growth in the productivity of capital goods production, from sources other than trade, also helped lower relative prices. The decline in the price of capital goods relative to the price of consumption, in turn, provided a sizable boost to real investment. Our model simulations suggest that a decline in the relative price of investment, due to a cut in capital goods tariffs or a boost in the efficiency of capital goods production, leads to a permanent and sizable increase in real investment rates. Colombia’s recent experience with tariff reform is a case in point. Firms whose capital inputs cost less due to the 2011 tariff cuts raised their investment. We estimate that a 1 percentage point reduction in tariffs on capital goods resulted in a 0.4 percentage point increase in investment. 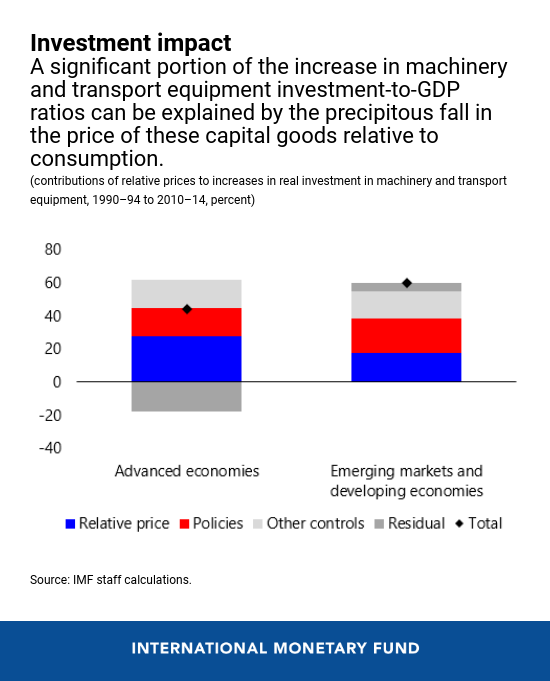 More broadly, our empirical analysis reveals that, for the average emerging market and developing economy, about one-third of the increase in the real investment rate in machinery and equipment in the past three decades can be attributed to the cheapening of capital goods relative to consumption, with stronger macroeconomic policies and other factors contributing the rest. The slowdown in the decline of the relative price of investment in the past 10 years may have provided an additional drag to the weak investment growth observed since the global financial crisis. 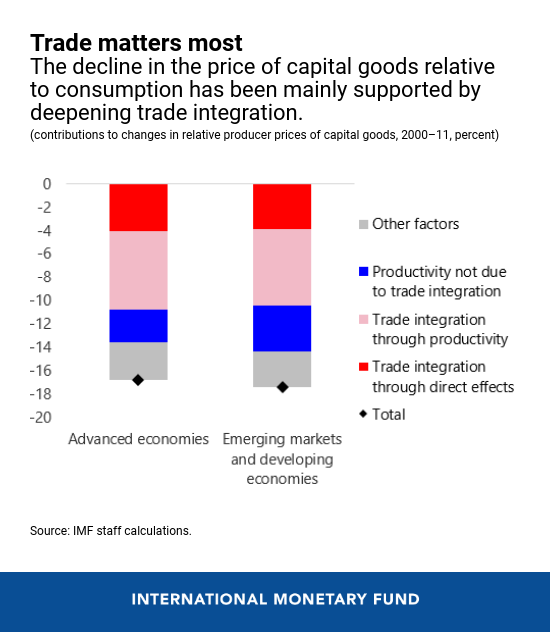 Our findings reveal an often-overlooked argument in support of keeping the wheels of trade in motion—that trade integration keeps the prices of capital goods down, encouraging real investment. With tariffs on capital goods averaging about 4 percent in emerging markets and 8 percent in low-income developing countries, there is still room to lower trade barriers. In lower-income countries, fully implementing commitments under the World Trade Organization’s Trade Facilitation Agreement could reduce nontariff trade costs by the equivalent of a 15-percentage point tariff cut. For all economies, avoiding protectionist measures and reviving trade liberalization would help maintain the pace of decline in the relative price of capital goods, providing a boost to the lackluster investment growth in advanced economies and supporting the capital deepening still very much needed in developing countries. Supporting innovation in the capital goods producing sector in both advanced and emerging market and developing economies is also crucial. Policies that encourage research and development, entrepreneurship, and technology transfer, as well as continued investment in education and public infrastructure can all help. But policymakers must also be mindful of the difficulties some workers and industries may face as the relative prices of machinery and equipment fall. As discussed earlier, the decline in the relative price of investment has eroded the share of income that goes to workers in economies where many jobs can be easily automated. Policies should be designed to help workers cope with potential job disruptions, including sufficiently broad social safety nets, as well as programs to support retraining, skill building, and occupational and geographic mobility.